Yujacha is a simple Korean tea made from the yuja fruit. It’s fresh, sweet, tangy, and has a strong and unique citron flavor and aroma. It’s perfect for warming you up in the wintertime, and is full of vitamin C. If you have a cold, it will always make you feel better. Any of my western friends who tried yujacha fell in love with the unique flavor and aroma from the first sip. The fresh fruit is nearly impossible to find outside of Korea, but readymade yujacha mix can be found in most Korean grocery stores or on amazon. The mix is nice but it can’t be compared to yujacha made with real, fresh yuja. If you’re in Korea, you can make this tea with real yuja, but if yuja isn’t available you can also substitute it with lemon. The great thing about yujacha is that you can drink the tea and eat everything in the cup except the seeds. Rinds, pulp, segments, everything! 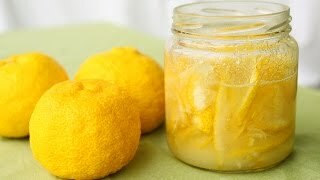 When I make lemon tea, I only drink the infused tea, the rest is too bitter and not tender. When I lived in Korea, yuja were very expensive. We used to say that if you had a few yuja trees in your yard, you’d never have to worry about your kid’s university tuition. But when I filmed this yujacha video on a recent trip I found the price had gone down quite a bit! Its great that you can buy high quality yuja at a more affordable price. Equal parts sliced yuja and sugar. Slice the yuja thinly. Remove as many seeds as you can find. Add to a bowl. Add a couple tablespoons of yujacha in a cup or glass. Stir with boiling hot water. Serve right away, with a small spoon. You can drink the tea and eat the rinds and pulp with the spoon. It will keep in the fridge for a couple months. Posted on Friday, December 11th, 2015 at 3:53 pm. Last updated on May 13, 2017. Posted April 5th, 2016 at 7:00 am | Log in to reply. I’ve never had yuja fruit before and can’t find it anywhere, but I have had good results with Meyer lemons. They are a bit softer and less bitter than normal lemons. After a day or two in the fridge, the peel softens up enough for my taste. I do use less than one whole part sugar, though. Probably 4 parts sugar to 5 parts lemon. I wish I could find some real yuja to compare it to the real thing, but my tea is pretty good. Thank you!!! Posted January 9th, 2016 at 7:46 am | Log in to reply. It’s great to see a recipe for this drink – Yuja is a great flavour that many in the west are starting to become more familiar with. It would be good if in the future, Yuja itself become mores readily available in the west. Posted January 5th, 2016 at 10:00 pm | Log in to reply. Posted January 7th, 2016 at 8:59 am | Log in to reply. haha, thank you for sharing your story about yujacha! That’s right, yuja and yeoja (female) sound similar! Posted December 13th, 2015 at 12:02 am | Log in to reply. I’ve known that because we’ve had the same discussion on a cooking-channel. Btw: 6 parts yuja to 5 parts sugar are enough, let the prepared mixture stand (in a non-metal container, covered) for a few days until the sugar dissolves before putting it in smaller jars. Yes, I’ve prepared Yucha-Cha before – great in summer, too! Posted December 12th, 2015 at 10:01 am | Log in to reply. Do you know if yuja the same as the Japanese yuzu fruit? By the way, I love your recipes and YouTube videos! Thank you so much and hope you never stop! Posted December 13th, 2015 at 7:46 am | Log in to reply. Thank you so much for interest in my recipes! As I mentioned, the yuzu i had grown in America tasted similar to yuja, but was smaller and different. Maybe yuzu in Japan is the same as yuja, but I never tasted it. Posted December 23rd, 2015 at 5:15 pm | Log in to reply. Yuja and yuzu are the same fruit. In America we call the fruit yuzu. Differences in taste can be caused by growing conditions — soil, fertilizer, minerals in the water, etc. This is my first year growing yuja/yuzu. Just now the fruit is bright yellow. Btw, the fruit makes a great marmalade. Posted December 24th, 2015 at 10:17 am | Log in to reply. wow, that’s so interesting! You grew it only 1 year and see the fruits? It used to take 15 years in Korea. Give us more information about this for my other readers, please. When grown from a seed it takes forever to get a fruit tree to produce fruit. So fruit tree producers take a small cutting from a tree that is producing fruit and graft it to new root stock. Using this grafting method fruit trees usually produce fruit the first or second year. That is because only the roots are a couple years old — the tree growing on the young roots is much older and already producing fruit. I do not know of any fruit trees that are not grafted this way. You can buy yuzu trees online from Four Winds Growers. 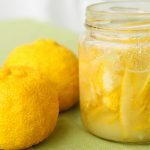 You can grow citrus in a pot – it does not have to go into the ground. This week I checked a local Asia market and fresh yuzu is now available for $3.99 lb. I bought 1 yuzu to compare with the yuzu I am growing. My yuzu is so much better. My yuzu smells much stronger and has a deeper flavor, and is appropriately tart. I scratch the skin of the store bought yuzu and I can barely smell it. I scratch my yuzu and it has a wonderful strong smell. Posted December 30th, 2015 at 9:26 am | Log in to reply. Thanks so much for your info about yuja trees. I appreciate the link, I never knew you could buy these trees in America! I’m excited to buy one and try it out! Posted December 12th, 2015 at 3:49 am | Log in to reply. This recipe was originally posted on December 11, 2015 at 3:53 pm by Maangchi. It was last updated on May 13, 2017. The video was watched 788,587 times on YouTube & has 14,823 likes!